At the University of Arizona, she played four years of volleyball, captaining the 1977 team and winning all-conference honors in 1976, the same year she was honored with the Phoenix Republic Sportswoman Award for Volleyball. Davenport played professional volleyball for the Tucson Sky (1978-79). In 1983 she became head volleyball coach at Pima Community College, wining Arizona Junior College Volleyball Coach of the Year honors in 1983. 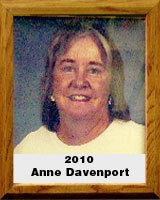 Davenport taught physical education, mathematics, and coached volleyball at Amphitheater High School for 30 years. She also started a junior girls volleyball program in Tucson that gave young girls a chance to develop more advanced skills before attending high school or college. In 1996, Davenport was back in school at Pima and was a member of the tennis team that finished second nationally. Her resume of volunteer work is huge, including assisting Humane Society volunteers with dog rescue efforts and running a water station for the Tucson Marathon.